We invite you to experience the excitement of 21st century whitewater rafting at its best on our purpose built whitewater course. All fun takes place under the friendly guidance of our highly trained river guides. We offer 2 different types of trips: guided rafting and self-guided rafting. 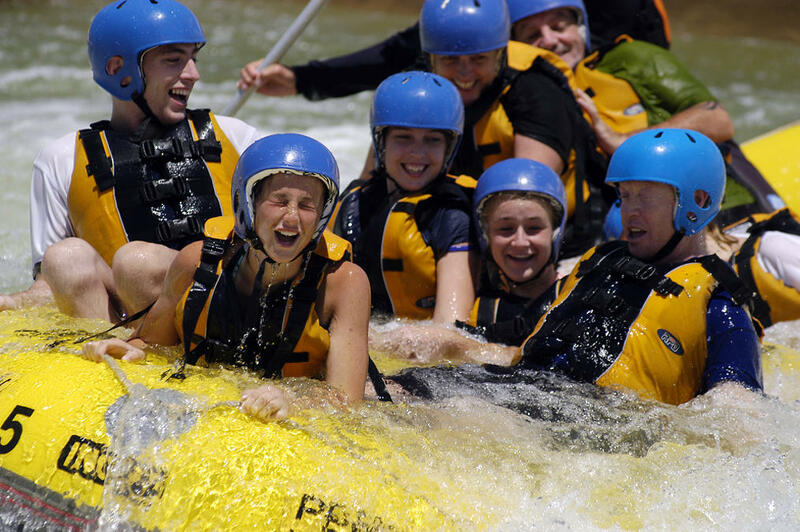 An action packed introduction to whitewater rafting. All trips begin with a safety briefing followed by flatwater instruction before venturing onto the whitewater. Each raft (with up to 8 crew) will be guided by one of our experienced river guides. Adventure Level: Moderate – High. We recommend that you be physically fit, a strong swimmer and be very confident in the water. Price: $94.00 per person (including GST) includes raft, equipment, instruction and a trained guide. Group discounts available. Our most challenging rafting trip and definitely not for the faint hearted! Each trip will begin with a safety briefing and our river guides will teach you the basics of guiding your own raft before ‘letting you loose’ on the whitewater. Each raft (with up to 4 crew) will be guided by…YOU! Price: $94.00 per person (including GST) includes raft, equipment and instruction. Groups discounts available. *Children under 18 years of age will require a parent or guardian to sign on their behalf. Alcohol and Rafting don’t mix, so please do not consume alcohol before rafting. Please note that rafting participants may have to pass a breath test (blood alcohol level of .05 or less) before being allowed to raft. Personal medication (eg. asthma, diabetes, heart condition) If you need medication bring it with you and have it accessible at all times during your trip. You must inform your Trip Leader of any medical conditions. If you need to wear glasses you should have some way of securing them in case you fall into the water (Glasses straps sold at venue). Please do not wear jewellery, leave all your jewellery at home. *Two Piece wetsuits are available for hire. One piece: $10.00 per person. Both: $15.00 per person. We also require a drivers licence or photo ID to be left as security. You will need at least 10 minutes to pick up a wetsuit and get changed before your trip starts. Bookings are essential and can be made by phone or in person. Penrith Whitewater accepts cash, cheques, money orders and credit cards. A minimum of 50% deposit is required to make a booking. Full payment will be required to confirm a booking at least 5 days prior to the trip date. Bookings made less than 5 days prior to the trip date will require full payment at the time of booking. More than 5 days in advance of the trip date a 100% refund will apply. Less than 5 days from the trip date the 50% deposit is non-refundable. Less than 48 hours no payment will be refunded. Penrith Whitewater Stadium Ltd. reserves the right to cancel or alter any trip dates and/or trip times. In these cases, you will be informed as soon as possible and every effort will be made to reschedule your activity at the earliest possible time convenient to you or we will offer a 100% refund. 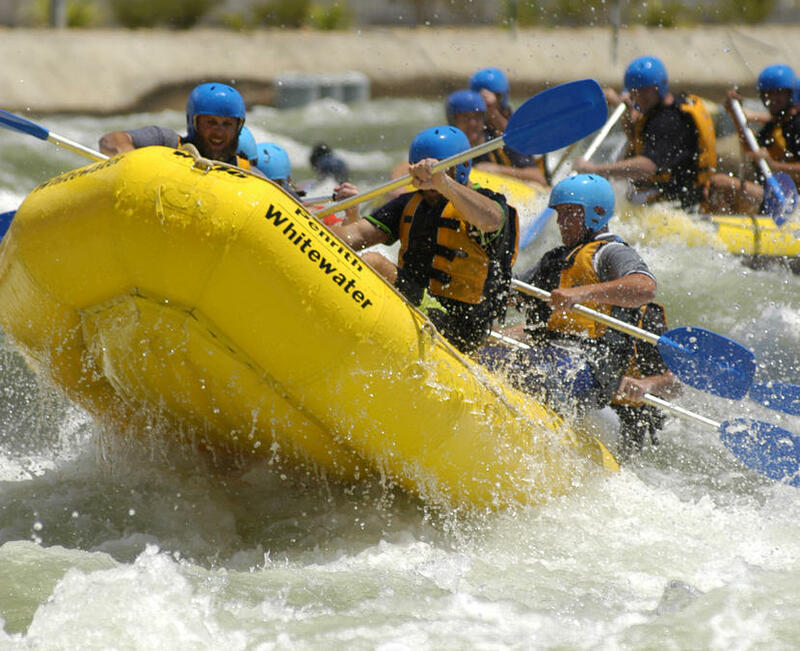 Prior to the activity you will be required to read and sign an ‘Acceptance of Risk Agreement’ acknowledging that whitewater activities have inherent risks and dangers beyond those normally encountered in everyday life. Minimum age for guided rafting: 12years. Minimum age for self-guided rafting: 16 years. Rafting trips are sold exclusively by Penrith Whitewater Stadium Ltd. and cannot be offered for sale or resale, or resold without prior written consent of Penrith Whitewater Stadium Ltd. Unless otherwise booked, rafts and/or trips may not be exclusive. While every effort is made to keep groups together, this is not always possible. At times crews may exceed eight for guided rafting. Penrith Whitewater is a non-smoking venue. Alcohol is restricted to certain areas by prior arrangement.